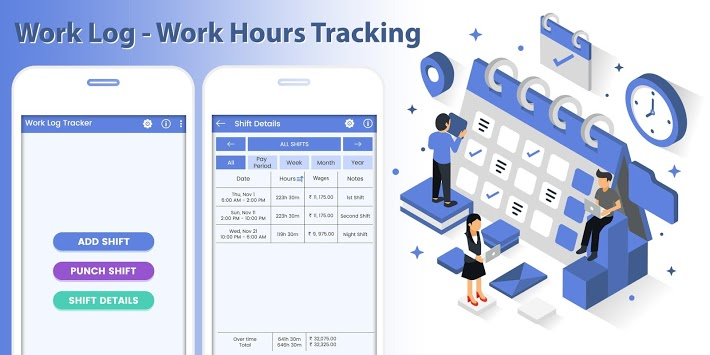 Work Log - Work Hours Tracking is a simple and compact utility that helps to keep track of working hours of your shift. It helps to add your shift or punch in and punch out your shift. You can view your shift details by pay period, week, month, year and all. It also calculate your wages, expenses, overtime, deduction, bonus, sales, tips and many others as per app setting and user needs. 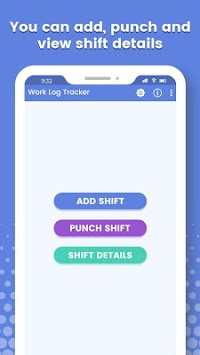 • Add your shift manually or punch in and punch out your shift. • Shows shift details and paycheck calculation all, pay period wise, week wise, month wise, and year wise. 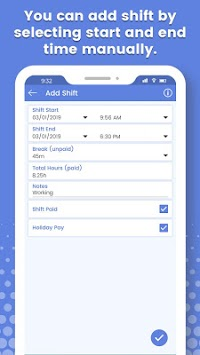 • You can sort shift details by shift start date time or no of working hours. • Flexible setting for wages, tracking sales, tips, expenses. • You can also calculate overtime by setting overtime detail from settings. • You can add deductions and bonus in your paycheck as per your need.